Back in Douglas Park for the third year in a row, Riot Fest feels like it’s finally settling into a comfortable groove in its North Lawndale home. There’s one less stage than last year and fewer performers on the bill, but the consolidation hasn’t had any impact on the quality of the lineup—and it’s easier than ever to navigate the park. With more rides and two new sideshow attractions joining the Hellzapoppin Circus, Riot Fest has also regained its carnival atmosphere after scaling back to a single Ferris wheel last year. On Friday, anyone arriving early was greeted by punishing temperatures, Liars’ propulsive mix of electronic and rock (performed by a frontman in a wedding dress) and the high-flying antics of the Circus Una Motorcycle High-wire Acrobats. Later in the afternoon, emotive rockers the Hotelier brought cathartic riffs to the Heather Owen Stage and industrial metal act Ministry got angry on the main stage (complete with a song called “Antifa”) while attendees munched on corn dogs and cheese fries. The evening presented a tough choice between New Order’s nostalgic ’80s dance party or the stark, autobiographical hip-hop of Vic Mensa. But everyone in the park crowded in front of the Riot Stage for Nine Inch Nails’s headlining set, which provided all the fog machines, strobe lights and taut renditions of songs from the band’s extensive catalog that anyone could ask for. 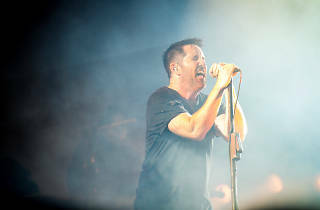 Trent Reznor and his band have undoubtedly been on Riot Fest’s wish-list for years, and their triumphant arrival in Douglas Park felt like destiny. 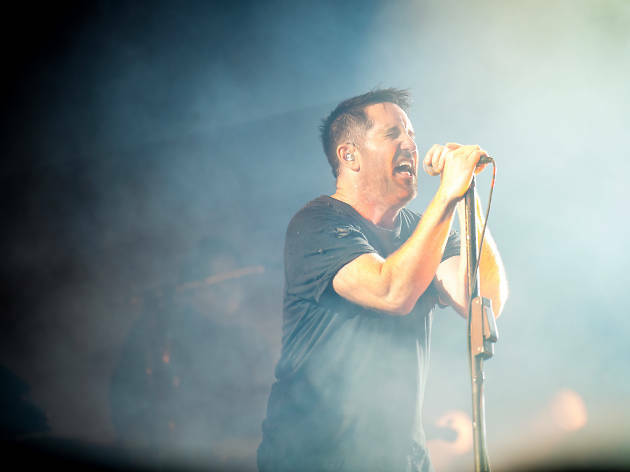 Take a look at our photos of Nine Inch Nails’s climactic performance and more of our favorite acts and sights from Friday at Riot Fest.